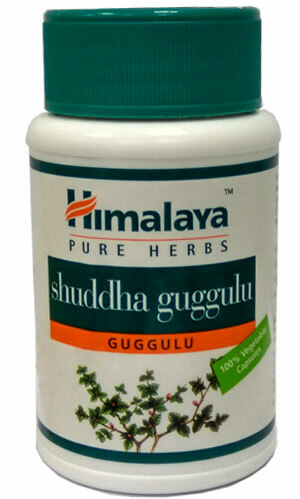 Guggul promotes normal cardiovascular wellness by supporting blood cholesterol and triglyceride levels already within normal limits, an important indicator for cardiovascular wellness. The herb plays a supportive role in the conversion of the thyroid hormone T4 into T3, the 'active thyroid hormone' relating to weight management and energy. By supporting thyroid function and particularly the up-regulation of T3, Guggul can also play a part in a comprehensive weight management program that includes a healthy diet and regular exercise. Guggul is history's broad-spectrum superstar! Guggul supports healthy joint function by preventing damage to key joint tissue structures (glycosaminoglycans) and helps alleviate joint pain and inflammation. Two capsules twice daily after food or as directed by your physician.